“Klingeling mit meinem Fahrrad/ fahr ich fröhlich durch die Welt./Einnmal linksherum, einmal rechtsherum/ Grade wie es mir gefällt.” A happy song about riding a bicycle, from a time when very few Berliners owned a car. 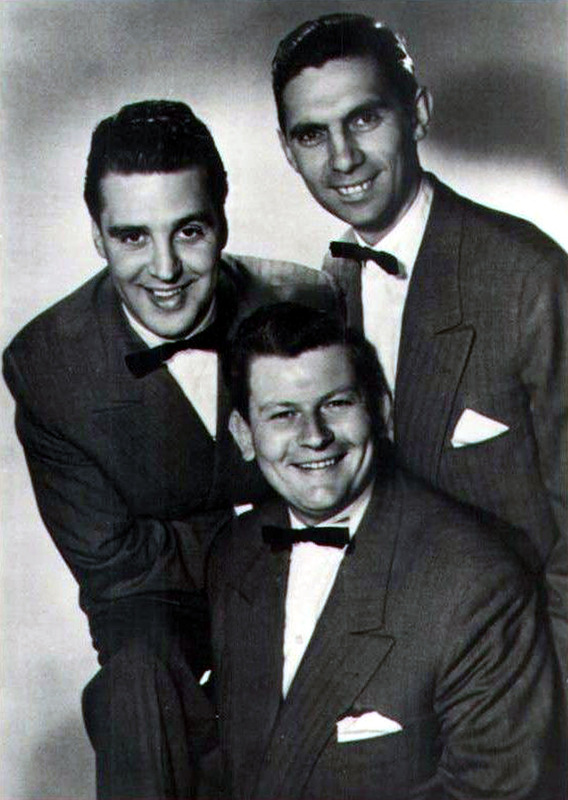 The Cornel-Trio (Peter Cornehlsen – baritone, guitar, Michael Lengauer – bass-baritone and Horst “Dickie” Kraft- tenor, double bass) was one of many German groups that were influenced by US-Rhythm’n’Blues-vocal groups of the late 40s. But while black vocal groups met on street corners, these guys met each other in the Wehrmacht in 1942, when they were still teenagers, and then went all the way through the war, captivity and release together. 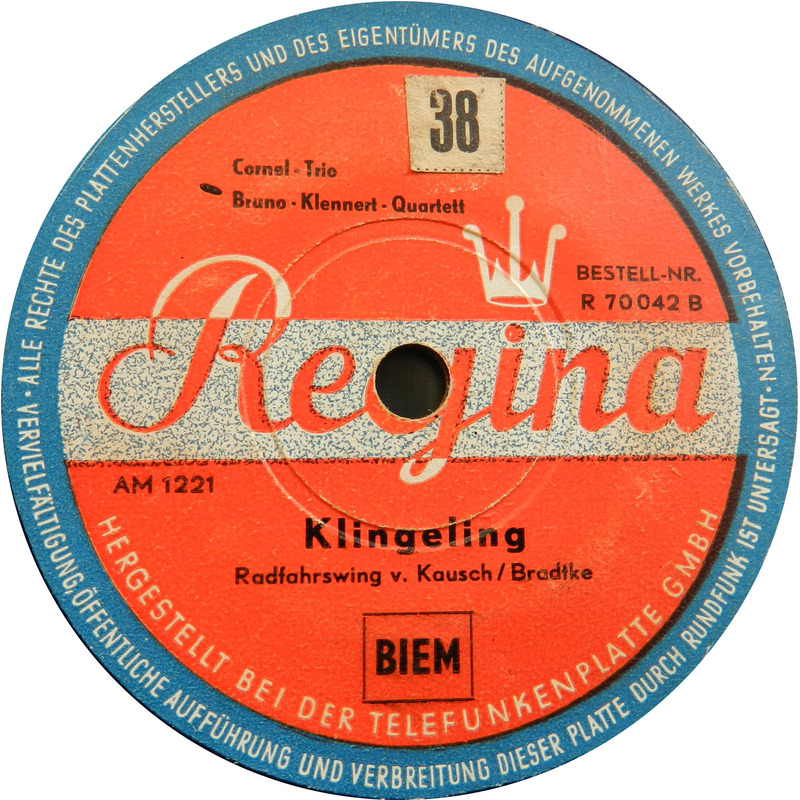 Originally recorded for Amiga, and backed by the Bruno-Klennert Quartett, this 78 rpm record was also released on its West-German subsidiary label Regina. The Cornel-Trio was a pretty productive group in their time, but of all the dozens of sides they recorded, so far only 13 songs have made it into the digital age through the retrospective CD Peter Cornehlsen & das Cornel Trio in 2008. Written by Edgar Kausch and cartoonist Hans Bradtke, this Radfahrswing has never been re-issued in any format since 1949. ” The only people who like this, are Götz Alzmann and you” my co-host sneered, after I had played this song on our radio show a while back. “I think it´s funny!”, I tried to defend my choice. “I´m shocked. Speechless”, he replied. He obviously hated the song. I said: “Wait, til´ I play my other songs…”. I do like obscure, regional German records and, yes, there are reasons, they never got anywhere. But it´s boring to only listen to the records by myself at home. 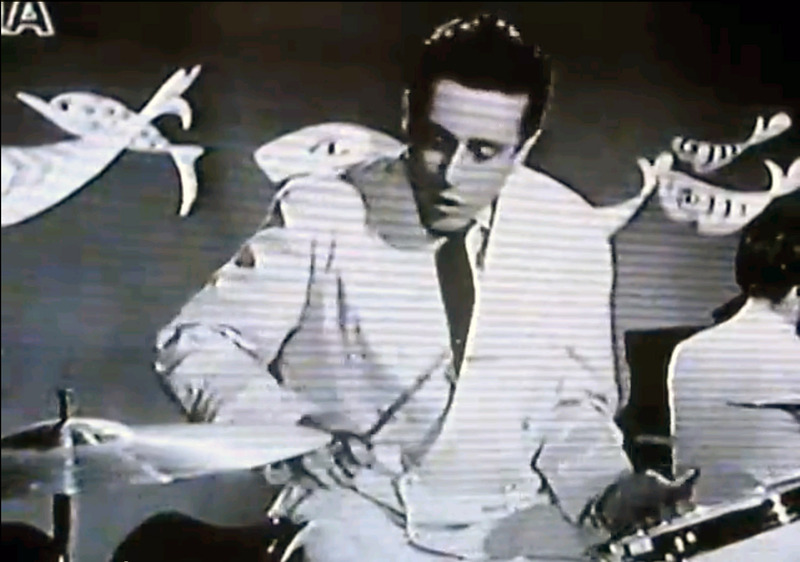 And it´s fun to catapult a local Berlin song into the digital world after 60 years of obscurity. Ilja Glusgal was born to Jewish and non-Jewish parents (according to his friend, jazz guitarist Coco Schuhmann) and went to music school when he was 9 years old, to learn to play piano and violin. 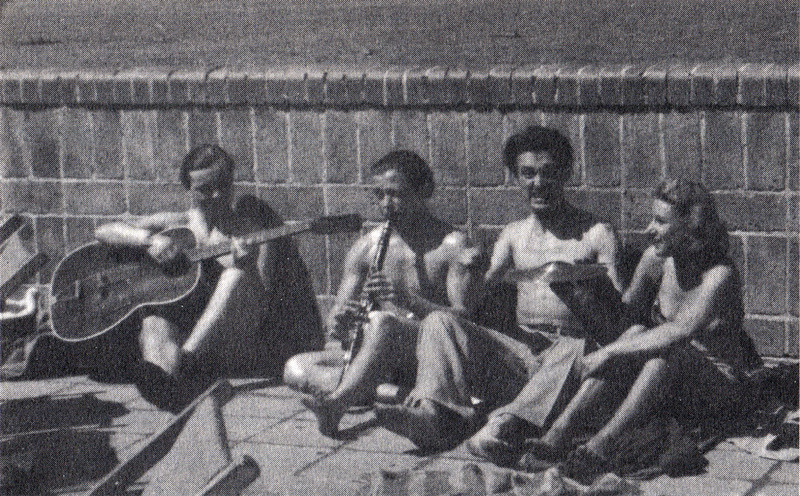 His first professional job was as a drummer in the swing band of Lubo d´ Orio in 1942, when he was 21. In 1946, he joined the new RBT-Orchestra ( Radio Berlin Tanzorchester), where his talent as a vocalist was “discovered” by Michael Jary. Handsome Ilja quickly became one of the first stars of the post-WWII-era and appeared in eleven movies. 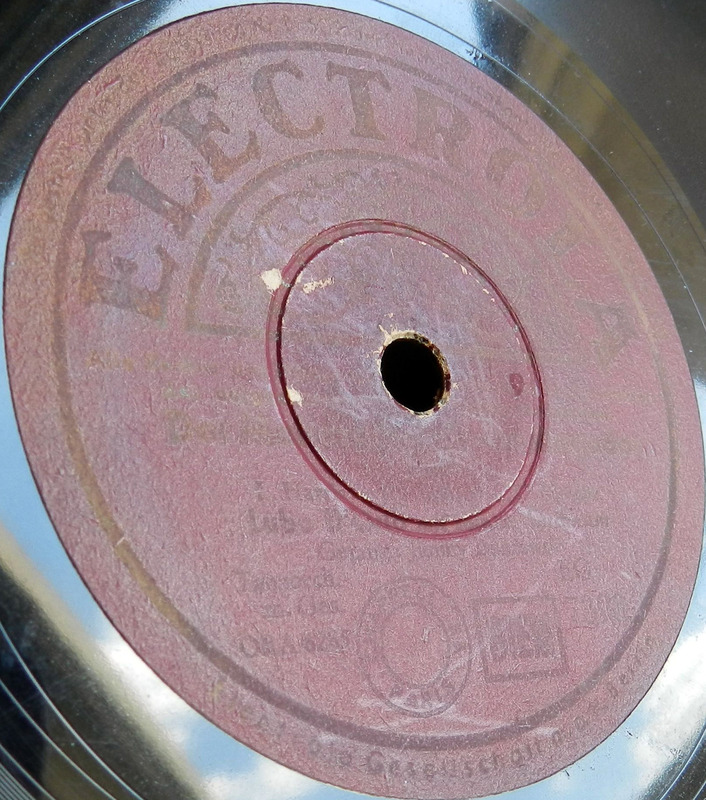 By 1950 he had recorded two dozen sides for the state-owned communist East-German Amiga label, but also for West-German labels Columbia, Electrola, HMV, Metrophon, Odeon, Parlophone and Regina. 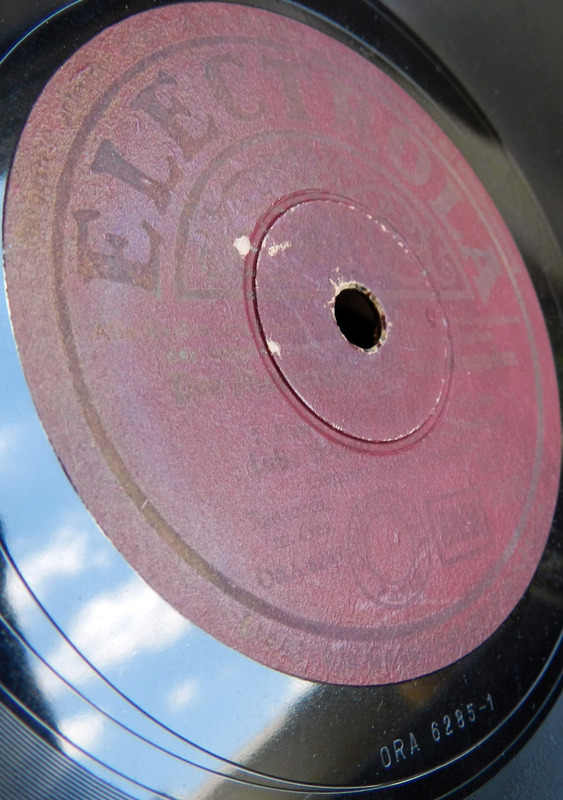 Glusgal even recorded a promotional shellack record for the German beer company Bitburger:”Bitte ein Bit”. His last seven singles of his short career were issued by Philips. 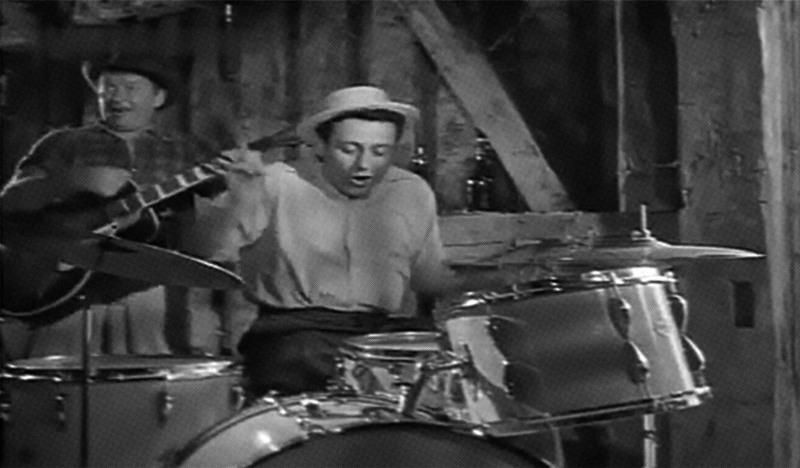 Around 1955 he settled in the United States and seems to have stopped working in the music business for good. Apart from an appearance in a German TV-show in 1964, his later life is a mystery. Ilja Glusgal died in 1983 in San Francisco, California. 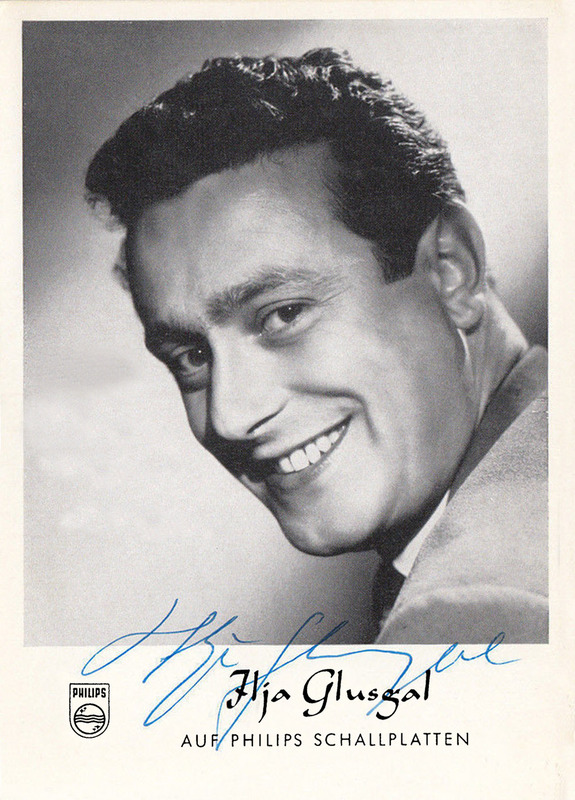 Ilja Glusgal was the most American of German post-war swing vocalists, if not all Schlager vocalists ever. 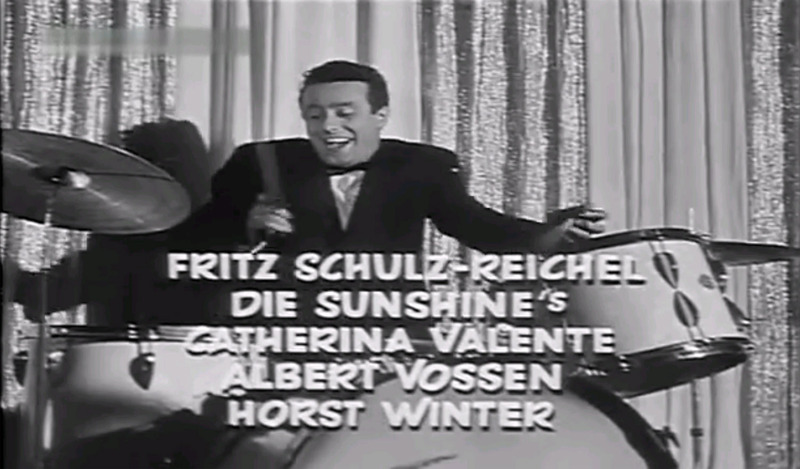 From Louis Prima´s Bananas and “Angelina, to Jeepers Creepers , to Sensation am Broadway, a German Version of Lullay of Broadway, he always tried to keep it swingin´. 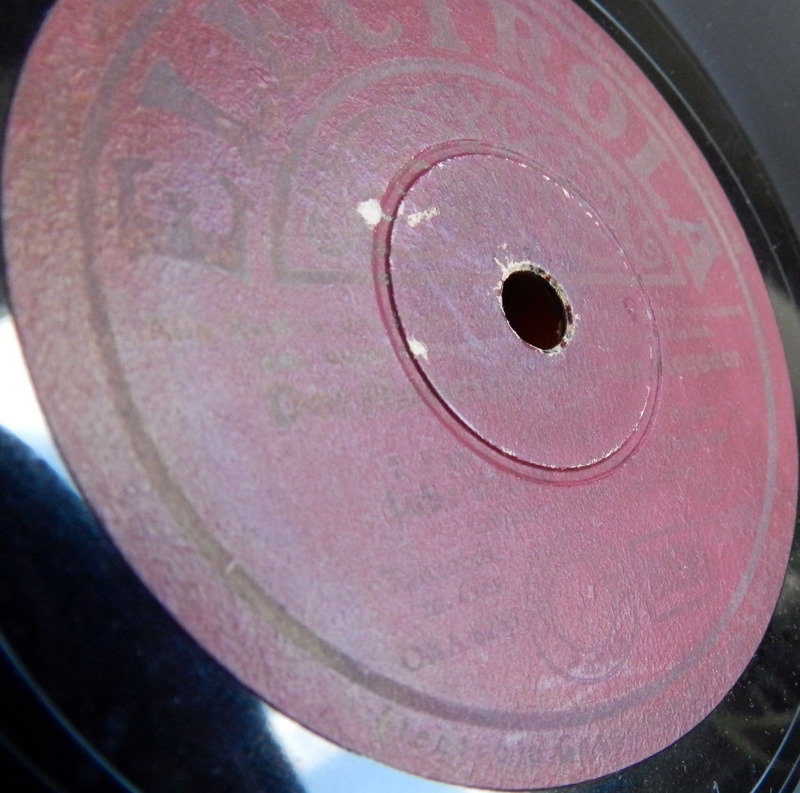 He even recorded two western-swing songs in 1949: Roy Rogers´ I’m An Old Cow-Hand and Peter de Vries´ Cowboy Jimmy. 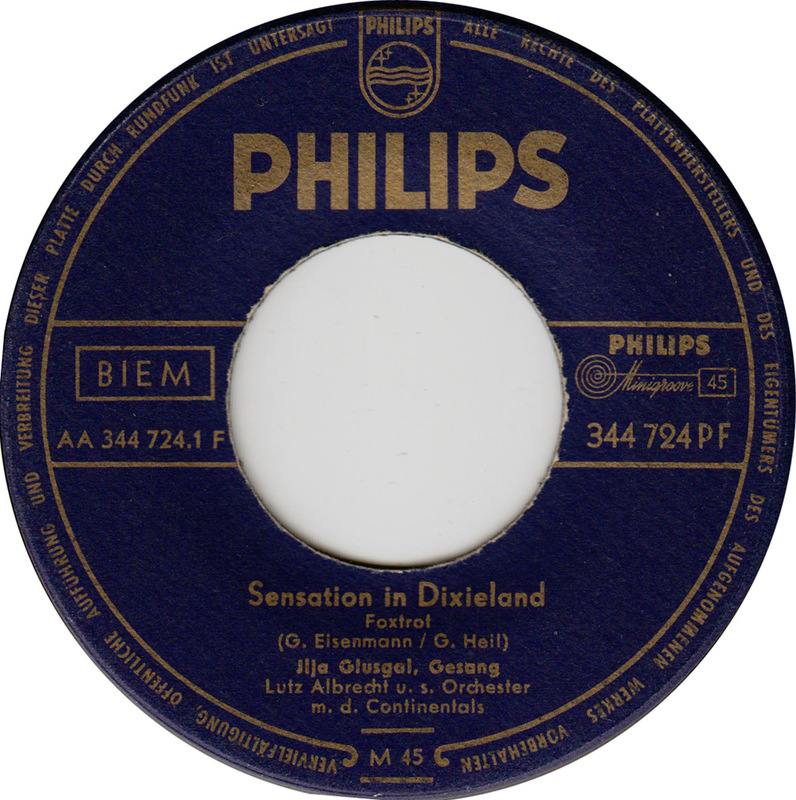 Sensation in Dixieland, backed by Lutz Albrecht and his orchestra and accompanied by the Continentals vocal group, must have been one of Glusgal´s last recordings. His genuine love for jazz music still shines through, though largely overshadowed by Schlager. This lack of purity is one reason it has not been reissued in 60 years. I hope I´m not the only one to like this type of Swing-Schlager….